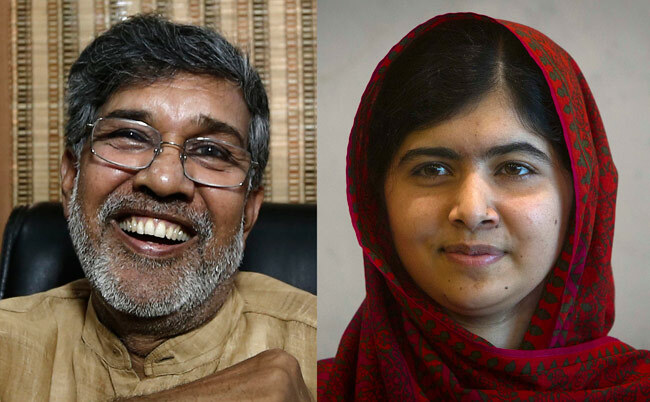 Malala Yousafzai, the Pakistani education campaigner and Kailash Satyarthi, an Indian children’s rights activist have jointly won the 2014 Nobel Peace Prize. The two were named joint winners of the award having a prize money £690,000 by the chairman of the Nobel committee, Norway’s former Prime Minister Thorbjoern Jaglandon. Malala Yousafzai is a Pakistani citizen and education activist from the town of Mingora in the Swat District of Pakistan’s northwestern Khyber Pakhtunkhwa province. She is known for her human rights advocacy for education and for women in her native Swat Valley, where the local Taliban had at times banned girls from attending school. On 9 October 2012, a Taliban gunman shot Yousafzai as she rode home on a bus after taking an exam in Pakistan’s Swat Valley. After the shooting, Yousafzai was airlifted to a military hospital in Peshawar,. After a three-hour operation, doctors successfully removed the bullet, which had lodged in her shoulder near her spinal cord. She was one among “The 100 most influential people in the World” in 2013, according to The Times. At age 17, Yousafzai became the youngest recipient of any Nobel Prize since they were first awarded one hundred and twelve years ago on December 10, 1901. Kailash Satyarthi is an Indian children’s rights activist born in Madhya Pradesh. He has been leading the Bachpan Bachao Andolan (Save the Childhood Movement) in rescuing over 80,000 children from forced labour with the help of local administration in a number of states including Uttar Pradesh, Odisha, West Bengal, Jharkhand and Delhi. According to the BBC, Satyarthi has faced attacks several times while rescuing children. He was attacked on March 17, 2011 while raiding a garment factory in New Delhi. The other attack took place in 2004, while rescuing child artists of the Great Roman Circus.